What was your past involvement with DanceBlue as a student? I was the Overall Chair for the first DanceBlue (2005-2006). Professionally, I serve as the Chief Administrative Officer for the distribution division of a financial services firm in Houston, Texas. Personally, I’m the proud mother of my one year old daughter Giuliana and my husband Brian and I are expecting our second child later this year. 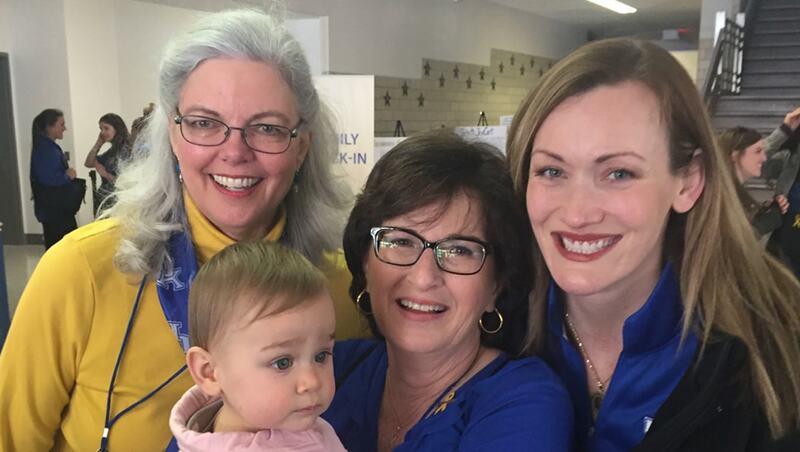 I’m a DanceBlue spectator these days – I love coming back to Lexington to support our families, dancers and leadership team in any capacity I’m needed. I am intentionally hands off throughout the year, though. We always intended DanceBlue to be a student run organization, not an alumni run organization – in order for each successive group of students to succeed and leave their mark on the DanceBlue legacy, I think it’s best to step aside and allow the chosen leaders to “lead.” I did pledge to become a UK Fellow when I graduated and still make automated, monthly contributions to the Golden Matrix Fund to help fulfill that commitment. I would definitely encourage all DB seniors and alumni to consider a similar personally giving commitment! What is your favorite DanceBlue memory? I have so many amazing memories from DanceBlue—everything was new, exciting, and always a little risky. I always remember thinking “Is anyone going to show up? Will families be open to participating? Will we raise any money? Will the event make it past the first year?” My favorite memory has to be the first talent show hour when one of the patients sang “You Raise Me Up.” Her rendition was so strong and pure, full of soul and raw talent far beyond her years. I remember looking around and realizing there wasn’t a dry eye in the house—everyone at Memorial Coliseum was so captivated and emotionally moved by her performance. In that moment, when I saw that deep, symbiotic connection between the students and the patients, I knew that DanceBlue would survive and thrive. I met Jennifer Mynear and Susannah Denomme in the fall of 2004 when they were trying to gain student interest in starting a dance marathon that would benefit patients treated at the UK Pediatric and Oncology Clinic (now the UK DanceBlue Clinic). At that time, my life was being turned upside down by a series of cancer diagnoses in our family, including a stage-4 lung cancer diagnosis for my father. I felt so helpless and lost until Jennifer and Susannah walked into my life, and I heard Jarrett’s story for the first time. His message of finding strength through service to others resonated so strongly with me—I knew DanceBlue was my calling as it has been for tens of thousands of student leaders and dancers since. I DanceBlue to celebrate the lives and memories of Jarrett Mynear, my father Fred Pfeifer and all of the kids and families this amazing organization supports every day.